Throughout its long history, Spencer’s has been a recognized and respected player in the Indian grocery business, and is synonymous with quality goods and services, trusted by India’s exploding population of the upwardly mobile middle class. Spencer’s has continually helped reshape the retail landscape in India, introducing a host of innovations to make shopping an even more convenient and enjoyable activity for the consumer, by creating an ambience that the consumer appreciates. Spencer’s designs its stores so as to deliver its brand promise in a sophisticated manner, thereby differentiating itself from competition. Over the years, Spencer’s has built a loyal customer base and a strong brand equity because of this. Central to the retail design strategy is it’s unique brand positioning of ‘Makes Fine Living Affordable,’ derived from its consumers’ transition from a price-conscious purchaser to a global-minded, well-travelled citizen of the world who is looking out for authentic international flavors and experiences. Spencer’s has consequently evolved from being just another grocery retailer to being a world-class hypermarket retailer. Interior Design – To ensure that shoppers enjoy a warm, friendly ambience with an upscale look and feel, the interiors are carefully chosen based upon the specific location of the store. The stores have color-corrected lighting, carefully selected veneers and textures that complement the color palette of the brand, thereby creating a fresh, cheerful, and expansive feel. Shopfit Design – The emphasis is on attractive, space-efficient, and low-maintenance presentation of modern, international goods alongside local products. The stores strive to drive product experiences through hubs. Graphics & Signage - Shopping at Spencer’s is a visual treat, enhanced by “Heritage boards” that tell the Spencer’s history, curved signage featuring the signature “Makes Fine Living Affordable” tagline, and category-specific color arches suspended over zones and departments to provide visual relief and act as navigational aids. 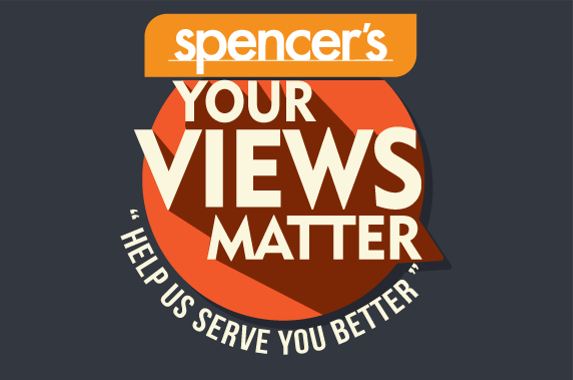 At Spencer’s, visual merchandising is taken very seriously, with the objective of using theatre and edutainment to depict Spencer’s as a retailer which ‘Makes Fine Living Affordable’. This is evident in the hotspots and focal points dispersed around the store, which carry thematic product displays to welcome shoppers and give them the opportunity to absorb the ambience that constitutes a ‘fine living” experience, before continuing their journey of exploration through the stores. It also extends to the presentation of merchandise in a store. Category-specific color-coding allows easy navigation, while visual metaphors of “farm-fresh” and “Fine Living” drive home its brand promise. Models of seafood, meats, breads, and cheese highlight the fish &meat and delicatessen section.